A little sweet treat, which I made before Christmas and held back from posting as I hoped it would being a little joy to January. This is another of Omar Allibhoy's fantastic recipes which I was sent by Olives from Spain, and when reading through it, my first thought was that it sounded like a divine and intriguing combination. Black olives and bitter dark chocolate go surprisingly well together, and the orange zest really sets it off. 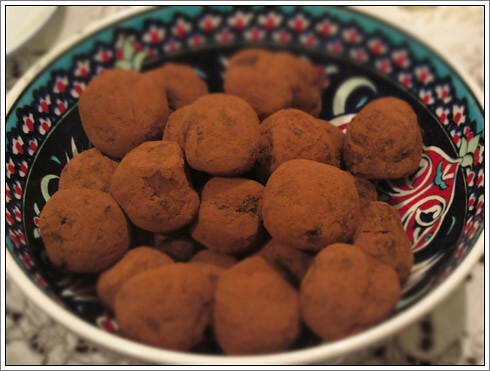 Truffles are surprisingly easy to make, and are fantastic gifts for chocoholic friends or relatives. They just require a little time and patience as they can't unfortunately be made in one single stage. If you want them a little sweeter, add about a dessertspoon of caster sugar to the cream when heating. Drain the olives and then finely chop them, then peel the zest off the orange, break up the chocolate and cut up the butter ready to use. Pour the cream into a saucepan and heat over a low heat until almost boiling. Turn off the heat, then stir in the chocolate, olives and orange zest. Keep stirring until all the chocolate is melted and you have a velvety, smooth sauce. While the mix is still warm, add the butter and stir until thoroughly melted into the sauce. Transfer to a bowl, cover with cling film and leave in the fridge for about 5 hours to set. Once set, turn the mix into little balls using your hands or a melon baller then dust with cocoa powder. I found it really helped to keep running my hands under icy water so I didn’t end up covered in molten chocolate as I rolled them!